Fireware 11.12 is Now Available! The version of OpenSSL used by Dimension has been updated. WatchGuard has posted a new maintenance release, Fireware version 11.4 Update 2, at the software download site. This releases includes many important bug fixes.The Release Notes include a comprehensive list of resolved issues. This is a maintenance update with no new enhancements. There is no corresponding update 2 version of WSM 11.11.4. Do These Releases Pertain to Me? 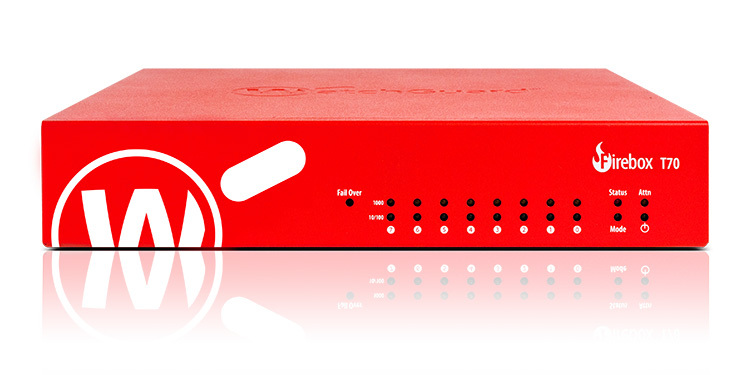 WatchGuard is excited to announce the launch of the Firebox T70, our latest tabletop network security appliance. The T70 has set a new industry best, with 1 Gigabit per second in full UTM mode with HTTP traffic, and over 600 Megabits per second with HTTPS traffic. Now, network administrators can confidently deploy a tabletop appliance knowing it will run the services necessary to secure their network without compromising performance. WatchGuard is pleased to announce the General Availability (GA) of new updates for Fireware, WSM, and Dimension, available now at the software download site. Support for Perfect Forward Secrecy (PFS) which are the most secure ciphers available for TLS protocols. Localization into French, Spanish, and Japanese languages. Data privacy and protection is a BIG deal, and many countries are setting new regulatory standards for how to move, store, view, and report on data containing users’ personally identifiable information, or PII. Choose the blog categories that are important to you to receive email updates every time a new post is added. Sign up to get the latest product news, updates, and support alerts from WatchGuard.